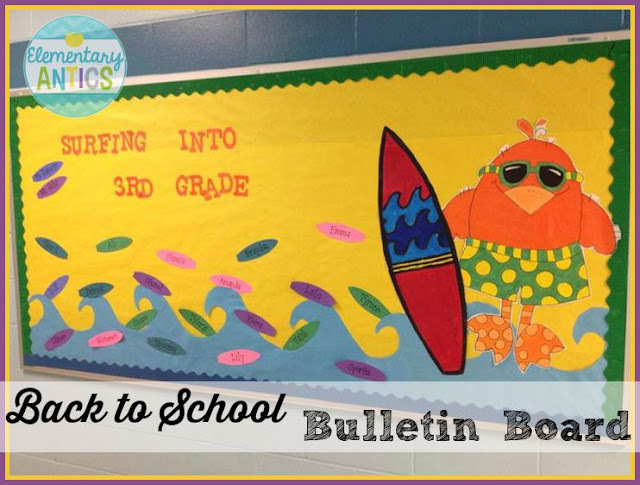 I am so excited to be linking up with Lucky Little Learners and Schroeder Shenanigans in 2nd for this month's 2gether We Are Better post all about BULLETIN BOARDS! I don't know about you all, but bulletin boards are not a huge thing to focus on at my school much anymore. When I first started teaching 12 years ago bulletin boards were a BIG deal- especially the beginning of the year board. Nowadays (at least in my district) we just don't have the time to worry too much about changing our bulletin boards every month. The last couple of years what I have done in my hallway board is use a design that will work all year that incorporates our school theme. Then I just switch out the work that is displayed every month or so to keep it updated. Now, this isn't glamorous and anything, but it was what worked for me and the I was able to spend my time working on a lot of other things in my classroom (like getting centers ready, looking at data, organizing my library, plus 100 more things)! Now, last year my school's theme was a beach/surfing theme, so I did a pretty simple "Surfing into 2nd Grade" Welcome Board. If you're familiar with Krista's work from Creative Clips, then you will totally recognize her cute clip art on my board above. I had a lot of questions about how I printed that out or where I printed it big enough for my board. Well, guess what? I didn't print it! I thought back to the old days when I used to watch my 3rd grade teacher make giant pictures for our classroom after school. She used to copy a picture on an overhead and project it on the wall where she traced the now giant image on butcher paper. Obvi, I don't have an overhead projector anymore, but I did have a projector and a computer! So, same idea with modern technology. I hooked up my computer, opened the line art picture and projected it on my classroom wall where I had white bulletin board paper taped up. I traced the art and then painted it and cut it all out. Viola! Totally cute clip art in bulletin board size. I kept that cute summer buddy bird and his surfboard up on my bulletin board all year and just added student work and a new title every month or so. Here's an example from the year before. We had a cruise theme. (Can you tell we live near the beach??) I found this awesome chevron fabric and used it to cover my board. I added a giant anchor and our school theme. Then, I just changed the work throughout the year. You can tell this picture was around winter time since we had just done our hot chocolate book reviews (a freebie from Across the Hall in 2nd Grade.) Again, just keepin' it simple. Same background all year and just update the student work. By the way, if you don't cover your bulletin boards with fabric- you should! I usually cover all the boards in my classroom and the hallway with fabric or plastic Dollar Store tablecloths so I don't have to worry about fading or anything like that throughout the year. 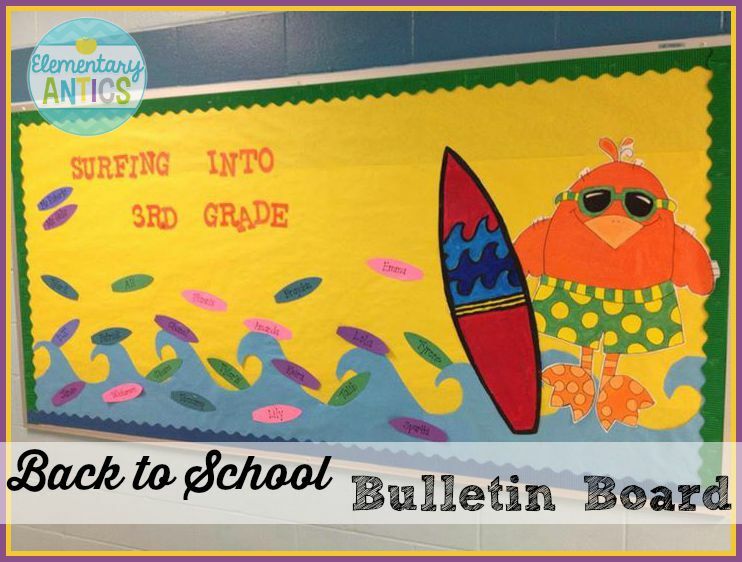 Follow my Bulletin Boards pin board on Pinterest for lots more fun ideas! 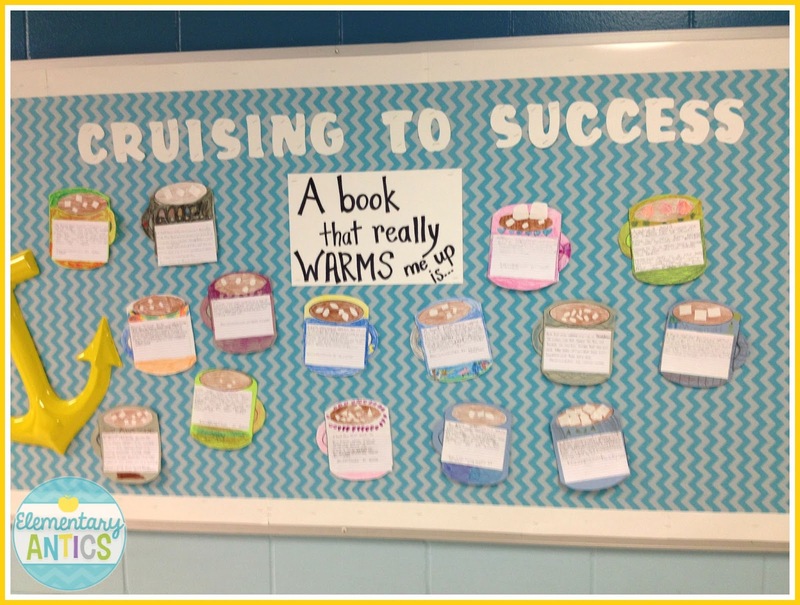 Follow Kim's board Teaching: Bulletin Boards on Pinterest. Go check out all of the other super fabulous bulletin board ideas in this awesome linky! I love the cruising to success board! Such a great idea! Your boards look great! I love Krista's clipart too! Great ideas! Love that chevron background.